"Suicide risk assessment is a necessary core competency required by all health providers. Regardless of location or setting, health providers are often the first point of contact for individuals and families who may be at risk for suicide. In North America, studies indicate that the majority (up to two-thirds) of those who die by suicide have had contact with a health care professional for various physical and emotional complaints in the month before their death. Unfortunately, many patients who are contemplating suicide do not spontaneously voice suicidal thoughts or plans to their health care provider, and the majority of those at risk are never asked about suicidality during general clinical assessments. Consequently, individuals at risk are often never identified and do not receive needed intervention and support." 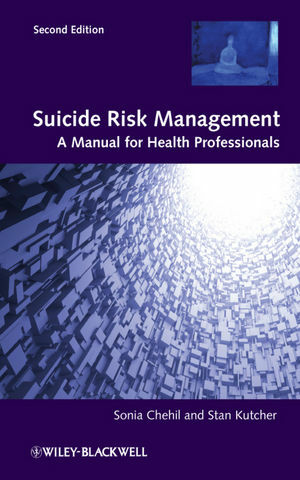 So begins Suicide Risk Management: A Manual for Health Professionals, a small book (5" x 7 3/4") that provides guidance on how to manage the suicidal or potentially suicidal patient. Written by two professors of psychiatry, the book has been used in courses for trainee psychiatrists and for health professionals around the world. To introduce the Tool for Assessment of Suicide Risk (TASR) and provide instruction on its appropriate clinical application. "Working with patients at risk for suicide is difficult and anxiety-provoking for many health providers. Even among mental health professionals who work with recognized populations at risk for suicide, working with a suicidal patient is considered one of the most stressful and challenging components of their clinical practice. Nonetheless, all health providers must have the knowledge, skills and competencies necessary to identify, assess and manage suicide risk with confidence, care and respect." This little book will help you do that. Please note: This course addresses risk management and is not a comprehensive study of the topic of suicide. Also, the authors are Canadian and the book includes Canadian spellings.